I approached the check in desk at Manchester airport with trepidation. My luggage allowance was 20 kilos with one bag and I had at least 40 kilos with two bags. I have in the past been charged over £200 for such mistermeaners. “May I have your passport?” said the chap behind the desk. I then cracked a joke about how early he must have got up this morning and that I was up at 4:30 am. “I was also up at that time” he replied, “What, every day?” I looked upon him with empathy as he nodded; we were now best friends. I think subconsciously I was trying to hypnotise him as I have been watching too much Derren Brown, we were building ‘rapport’ and he was not totally under my control. I was tempted to throw in a few suggestive words there as well when I disclosed that I had a second bag with tools in. He frowned “…..Errrr One thing I will miss about the UK is that it is so LIGHT, AS it is so dark in Finland. Luckily I have A warm Feather coat.” The scales did not agree: 20 kilos. After glancing at the scale he then looked up and at me amiably and smiled. This is not the usual way that people at the check in desk ask you for £200 “Did you know that we have a relaxation lounge?” I must have looked bemused. “…..you can go there and escape for a while if you want. Also, you are on Fast Track so you can just pass everyone else and go straight through, no need to wait around. Have a nice flight Mr Wardley.” Derren Brown eat your heart out! The plane was quite late in departing which was a little worrying as I had a connecting flight. I didn’t do the Fast Track thing as I just don’t think I’m quite ready for it yet, far too racy for me. I also passed on the Relaxation Lounge, there was something a little fishy going on and I wasn’t sure I wanted to chance it just yet. As I queued in the tunnel to go on the plane I looked at my ticket for my seat number. Mmm, there must be a mistake. I had never sat on row one before. I looked away and then back again. I could cope with the F as that means I am by the window which is what I asked for. But I didn’t understand this 1 business. And then I saw it at the top of the ticket. “Business Class.” I was for the first time in my life in the elite. As I turned the corner my throne awaited me. There were no other people of my status there that flight so I took all the glory myself. 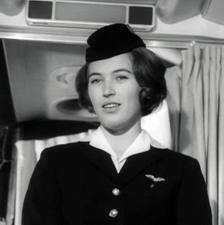 My personal airhostess leaned towards me with a beaming smile: “Financial Times?” I have never had anyone offer me anything before in such a want to please way, and the words that came out of her mouth were ‘Financial Times’. As she did the demonstration I then felt it my duty to watch her, she kept looking over me to make sure I fully understood everything and would occasionally crack a few jokes. I think she was trying to hypnotise me. During the flight she offered a silver plate with a blob of some description on it. I took the lemon scented delight to be something marvellous to put in my mouth. I took the plate from her and was about to indulge before she pulled back the plate and said “Err, it is for your hands!” Ah, a hand towel. She then asked me if I wanted an antipasto before my meal and I floundered. I don’t think it took her long to realise it was my first time. But to her credit she was not discouraged and continued to hang upon my every whim like my own personal angel. At one point she said with deep regret “I’m just going into the ‘tourist section’, but if you need me just press the button.” I made a deliberate slow nod of understanding. On landing I queued at the door and I and the airhostess had a brief little chit chat about how cold it was in Finland and how much it has snowed. This became evident when she opened the door. I gave her a look and didn’t know whether I should embrace with her but thought better of it. It had been one of my best flights ever and I walked away with a bounce in my step. Unfortunately, it was a very late best flight and I missed my connection to the north. She had definitely hypnotised me.